�..Although Bogart was incorporated, it was very much like living in the country. After all, we had cotton and corn fields, pig pens, barns, milk cows, pecan orchards, and such like inside the city limits��.. I received an email today from Jack Hogan, a native of Bogart, GA, talking about small towns. Many of us who grew up in Oconee County in the 40’s and 50’s can relate to this article. The article will bring back many memories for many of us over 60…..
Jack graduated from Bogart High School in 1954. 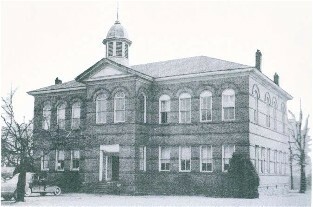 Bogart and Watkinsville Schools were consolidated in 1956-7. Two Hogan brothers, Don and Larry, attended Oconee County High School on Mars Hill Road at Butler’s crossing. Donald was in the first OCHS Senior Class, 1957, and Larry was in the first Sophomore Class. I was in the Class of 1958, the first Junior Class and second graduating class. Those who didn't grow up in small communities IN THE 40'S AND 50'S may think that the following is untrue. However, I am of the age that I can relate to every one of these things. They are indeed true, and reminds me of Bogart, GA where I was raised. 1) I could name everyone I graduated with and almost everyone in high school. This was no big deal! There were only 20 in my graduating class; about 100 in high school; about 300 in the first through the twelfth grade. 2) I knew what 4-H / FFA / FHA meant. 3) We didn't give directions by street names but rather by references. Turn right by the Salmon's house, and go straight past the Christian Church. It's the third house on the left pass the church building. 4) There were no organized sports until high school, no little league for any type of sport, no golf course, no recreation center, no health club, no youth centers, etc. 5) Our car stayed filthy because of the dirt roads, and people generally did not own a dark vehicle for this reason. All roads in Bogart were dirt. Only highway 29 was paved. Road scrapers generally driven by members of the county chain-gang kept the roads smooth. You could always count on rain the day after scraping. 6) You didn't like the town next to you very much, but it was actually just like your town. 12) We thought folks with a brick house or newer than 1945 were the 'rich' people. 14) Anyone you wanted could be found at Patat's Store or gas station. 15) We would see several friends each week driving a tractor through town or driving a wagon pulled by a mule(s). 16) You would occasionally hear sounds of 22 rifles and shortguns in the city limits as men and young boys were hunting squirrels and rabbits. 17) When we decided to walk somewhere, at least five people would pull over and ask if we wanted a ride. 18) Our teachers sometimes called us by our older siblings' names. 19) You could charge at any local store or write checks without an ID. 20) Most people used brush brooms, slang-blades, or reel type/push lawn mowers to clean the yard. 21) Young boys pee'd in the corn field / cotton field / hayfield / pecan orchard, in the yard, behind the bush, behind the barn, and in the out-house. 22) I remember driving a tractor before I did a car. 23) A lot of people went by a nickname. 24) Some of the men and older boys kept their guns in the car/truck so they could go hunting after school. They had been hunting with a gun since they were 10 to 12 years old. 25) Five out of ten high school boys could do a pretty good job of tuning a car's engine; and three out of ten could probably rebuild that engine. I wasn't one of them, but I could really chop, hoe, and pick cotton big-time. groceries, for other goods at some of the local stores, and for doctor bills. 27) Some had heard of but had not yet actually seen a TV program. 28) Going to a picture show in Athens on a Saturday and buying a comic book may have been the highlight of the week. 29) Although Bogart was incorporated, it was very much like living in the country. After all, we had cotton and corn fields, pig pens, barns, milk cows, pecan orchards, and such like inside the city limits. 30) Our first phone installed about 1950 included five parties. Our ring was two shorts. When you picked up the phone, the operator would say number please. The number generally had only four digits.